20. We have attempted to follow the programmatic leadership of the national organization within the limits of our own commitments and resources. 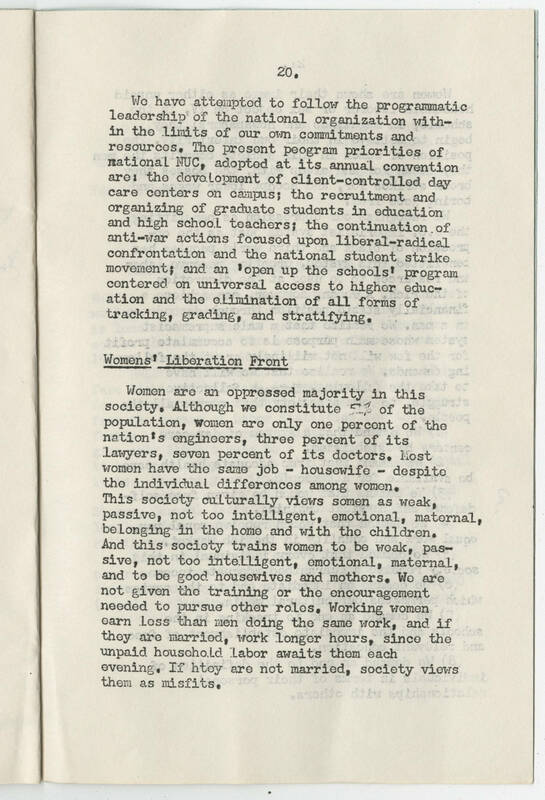 The present program priorities of national NUC, adopted at its annual convention are: the development of client-controlled day care centers on campus; the recruitment and organizing of graduate students in education and high school teachers; the continuation of anti-war a actions focused upon liberal-radical confrontation and the national student strike movement; and an 'open up the schools' program centered on universal access to higher education and the elimination of all forms of tracking, grading and stratifying. Womens' Liberation Front Women are an oppressed majority in this society. Although we constitute 52% of the population, women are only one percent of the nation's engineers, three percent of its lawyers, seven percent of its doctors. Most women have the same job - housewife - despite the individual differences among women. This society culturally views somen as weak, passive, not too intelligent, emotional, maternal, belonging in the home and with the children. And this society trains women to be weak, passive, not too intelligent, emotional, maternal, and to be good housewives and mothers. We are not given the training or the encouragement needed to pursue other roles. Working women earn less than men doing the same work, and if they are married, work longer hours, since the unpaid household labor awaits them each evening. If they are not married, society views them as misfits.